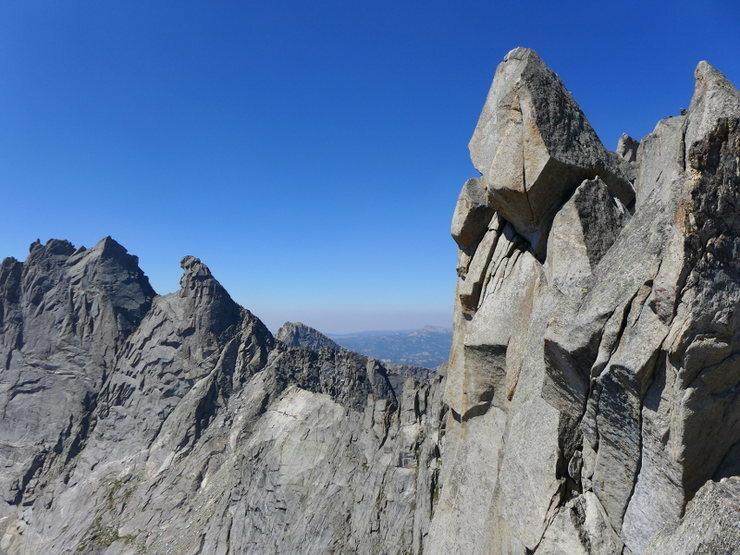 As a long-time Sierra climber I feel blasphemous writing this, but the Cirque of the Towers is the most spectacular place I have ever visited. And what better way to explore it than with a traverse of the 11 major peaks, and that also includes one of the 50 Classic Climbs. 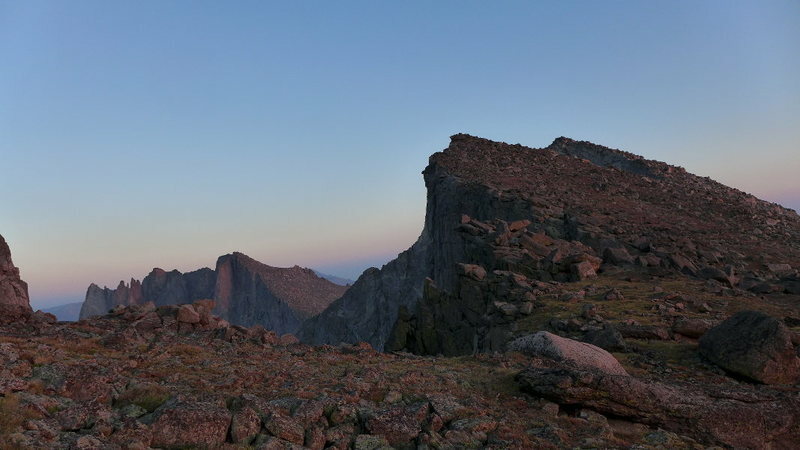 I rated the traverse based on the easiest path that tags the true summit of each peak while still starting at the S end of the ridge at Pingora and not doing any major deviations from the ridge. 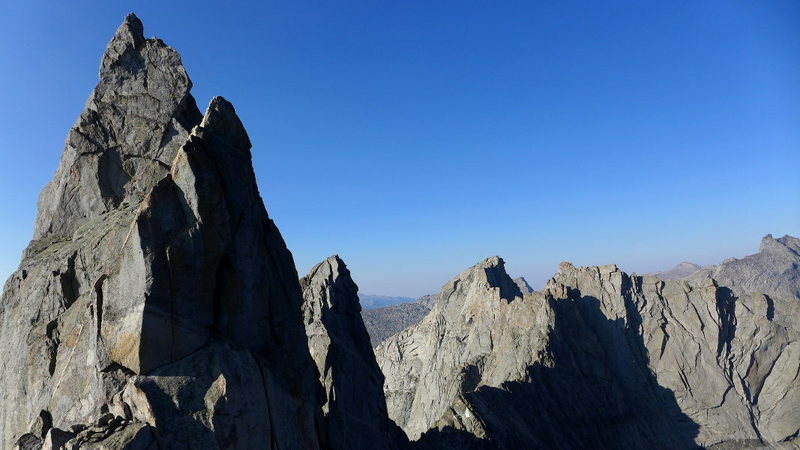 Note that as with any traverse there are variations, as well as some contention around the Shark's Head true summit, which will cause the rating to vary for individual parties. I used Kelsey as the source of truth given his extensive knowledge of the range. Pinedale, WY with groceries, gas, brewery, laundry, 4G, library, and showers at the super nice rec center. If you have time check out the Museum of the Mountain Man. You can also go in from Lander, bu this adds an extra hour to the drive. 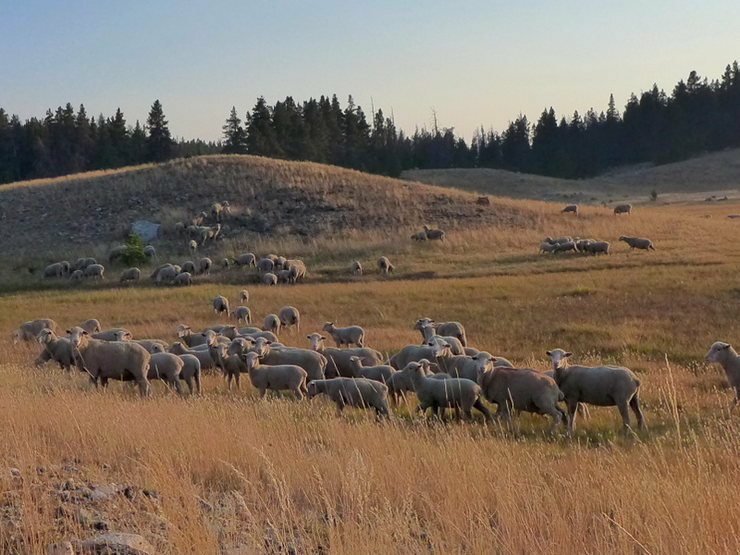 The Tetons Climbers’ Ranch said they mostly use NOAA for the Winds. With the topology the Cirque tends to be extra cold and storms can creep up on you unexpectedly, so take the forecast with a grain of salt. Mosquitos are bad at times. I was told to go mid Aug through early Sep, although I’ve been burned on weather in the Tetons in early Sep.
Bathrooms/campground at the trailhead. Primitive camping also allowed in established spots along the way. No bear boxes, but keep food contained. Lots of rivers and lakes along the way and in the cirque, but no water on the ridge unless there’s snow to melt. There are many established primitive campsites in the Cirque. Please keep the area pristine with leave no trace ethics. If any of the rock seems crappy you’re off-route. The raps tend to be directly above whatever notch separates your next objective with the exception of the ones off of Wolf’s Head. Be prepared for many raps. Route-finding is fairly straightforward compared to some of the Sierra traverses. Most people start the traverse with the S Buttress of Pingora (5.6 or 5.8 with the K Cracks variation). Approach the route from the left side of the S shoulder via 3rd class ramps. The route starts on top of the shoulder where the main formation steepens. After the Pingora summit drop down to the raps stations to the west into the notch between Pingora and Wolf's Head. Don’t use the normal S Buttress raps. Staying on the S side take the ledge system (4th) until you join the Wolf’s Head E Ridge. 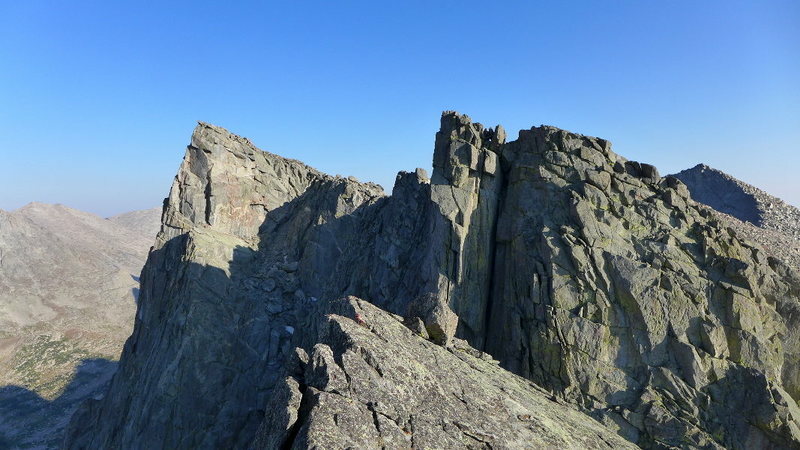 Follow the beautifully exposed E Ridge to the summit. If you like Matthes Crest you'll love this route. It's deservedly in the 50 Classics. 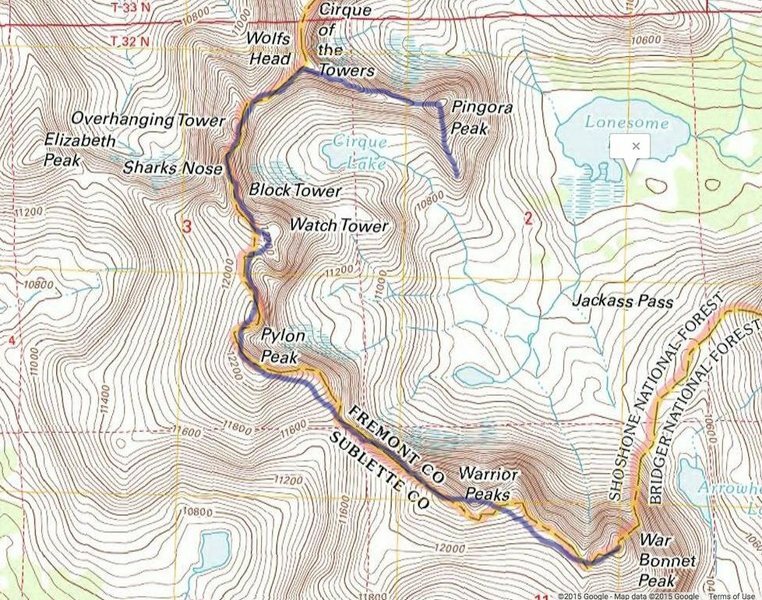 There are many ways to descend from the summit, but the goal is to rap to the west until you can hike south to the gully in between Wolfs Head and Overhanging tower. I mostly downclimbed this. From the notch take the NW Ridge/W Face route to the summit. Downclimb (5.5) or rap from the summit into the notch separating Overhanging Tower from Shark's Tooth. There seems to be some disagreement between Kelsey and Bechtel as to the true summit; Kelsey says it's the N one, Bechtel the S. At least some of the former speed record holders only did the N so take your pick. From the notch head up the higher of two ramps. At this point I continued trending right passing some rap lines, then up past a piton. I ended up at the base of a fairly committing rightward slanting crack (5.6). After the crack continue up easier terrain to the summit. Traverse the ridge toward the S summit. The 5.8 section, although a boulder problem, is super exposed and burly. I suspect most people will want a rope here even if you soloed the rest. If you did the S summit rap down into the notch between Shark's Nose and Block Tower. From the N summit head along the ridge to the S summit until you're able to set up a pendulum over to easier ground on the W side (obvious ramp). There were older anchors here, but they had been cut. The ramp linked me into the S summit raps. There are other rap options directly off the N summit, but this seemed more direct. From the notch take the 4th class ramp until you reach a 5.5 chimney on the E Face. Take this to the summit. From Block Tower rap into the notch at the base of Watchtower. The easiest way is to slog up the gully just to climber's right of Watchtower until you top out on flatter, more stable ground to reach the summit. At this point you're mostly hiking with a little bit of scrambling as you tag the summits around the cirque. Park at Big Sandy trailhead (42.6885,-109.2695). The graveled roads to reach Big Sandy are long, but mostly in good condition with the exception of the last few miles. There were a number of 2WD low clearance cars at the trailhead when I went. From the trailhead follow the signs to Big Sandy Lake (trail 99, marked), ~5 miles. Continue on toward Jackass Pass past North Lake where the trail will begin to ascend steeply to a flattish area. Before the trail ascends again look for a trail heading off to the left toward Arrowhead Lake and the Cirque (both hidden). The turn-off was cairned as of Aug 2015. The Cirque can also be reached from Jackass Pass, so don’t worry if you miss it. 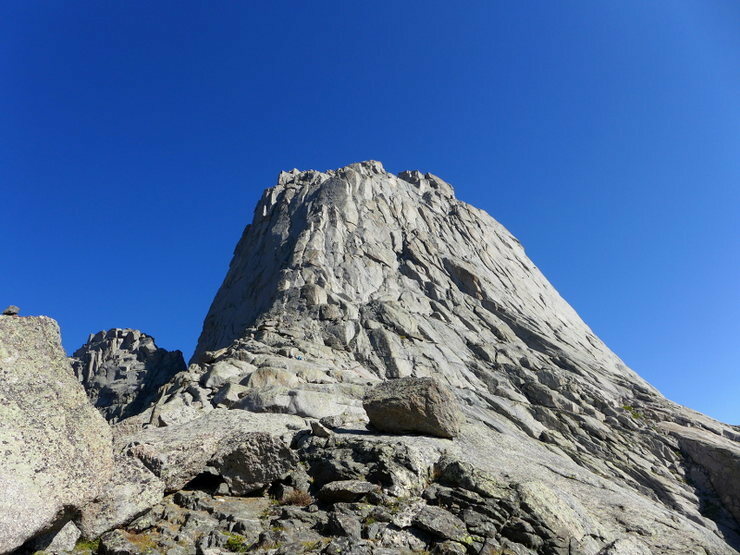 Cross the Cirque to the prominent S Buttress of Pingora. There is plentiful water and camping in the Cirque as well as all along the approach. From the summit of Warbonnet continue S then E, dropping down to Big Sandy Lake. Catch the trail back to your campsite or to your car. 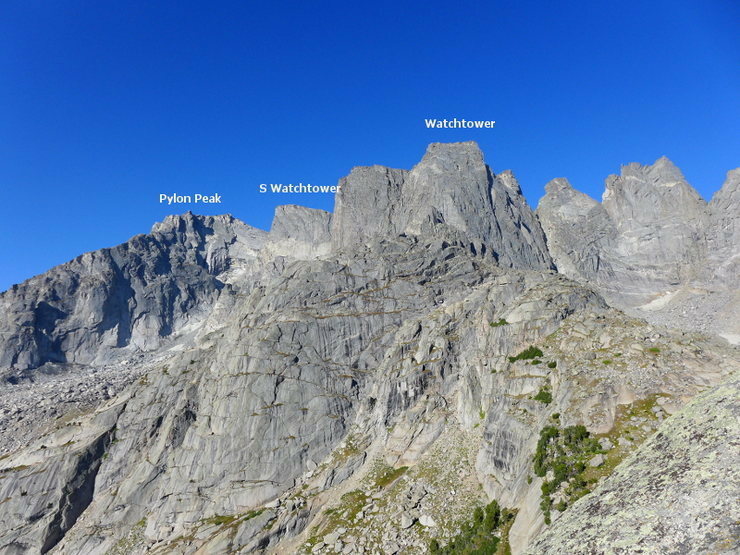 Hey all, I'm considering linking this route up after doing a backpacking trip on the Wind river high route. (week long trip). Do any of you know logistically how I could make that happen? maybe leave a car at the trailhead near the cirque traverse with climbing gear? or suffer and lug the gear on the trip? My partner and I are very fit, but I wouldn't make him follow me up anything more than 5.9. This route appears to be do-able under 5.6? Also, permit-wise I can't seem to find any restrictions or other info online. I plan on doing this in early August this summer. Parking at Big Sandy for that trip looks logistically less appealing if you're also planning to use that car for the shuttle. You could bribe some friends to meet you or use one of the pack outfitters in Pinedale to get your gear to the trailhead or Cirque. @fossana thanks for the info brother. I think I am gonna sweet talk my mom into driving us to Big Sandy, dropping gear and car, then leaving us at Green river lake since she is in Driggs. Good news about permits. How's the exposure and gear on the route? From Skurka's beta: West-side access is less ideal for a thru-hike. It’s a 4-hour, 100-mile drive between trailheads... And there’s no good route to Wind River Peak from Big Sandy: to avoid a loop or an out-and-back, it’s necessary to drop out of the high country for an unacceptably long time. Skurka does a lot of enduro routes and his logistics info is reliable. We just finished the Traverse last week and it was incredible! The Cirque is straight out of Lord of the Rings. Weather was your standard alpine unpredictable beast, splitter blue bird one moment and snowing the next. I think for most this is a Grade V route. 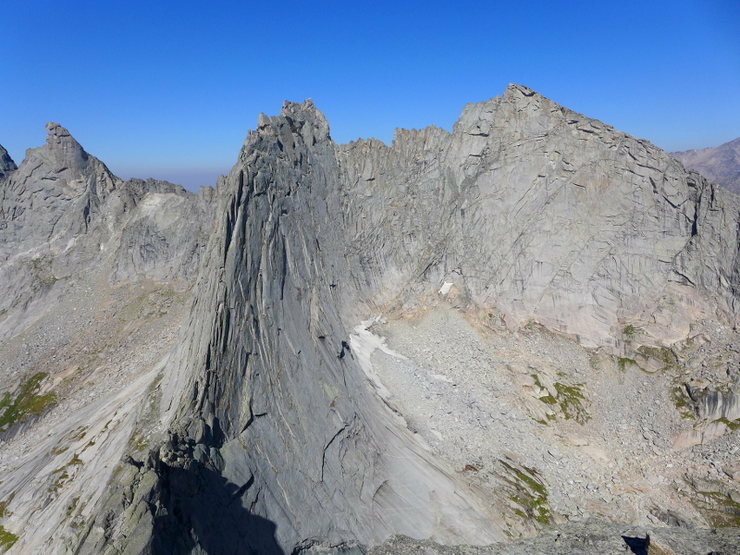 Wolf's Head alone is ~10 pitches grade IV, tack on ~17 more alpine pitches, ~15-20 raps, route finding, stuck ropes, boot jams on Wolf's Head, and nearly 22 miles to bag all 13 summits; all but the fastest parties will be bivying somewhere. The Cirque Traverse is BURLY! we were moving on route ~34 hours. Gear: Single 60M, BD UL's to #3 (doubles .4-#1 if I remember correctly), ~8 alpine draws, paired down set of nuts and offsets, 4 cordelettes to backup raps (we used up 2.5). Bivy locations are plentiful the entire way. On the Shark's Nose South Tower raps there are some really good ledges where we bivied. At the first prominent tower on Wolf's Head (before the piton pitch) if you go left it's a 5.9 bulge to a short 5.6 chimney followed by quite possibly one of the best hand traverses (4 stars hands down) you could imagine. Once you crest the chimney it puts you on a ledge the size of a horse saddle, then there is a 30 ft horizontal hand crack (5.7) with 1000 ft of vertical rock underneath your feet on small edges. Absolutely worth it if you are comfortable at the grade. I think that was the highlight of the entire traverse for me and it wasn't even part of the actual route. 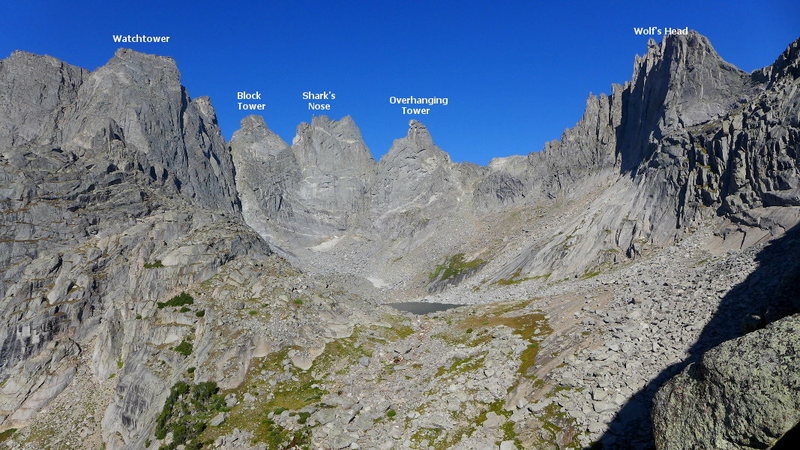 I agree with some of the above comments that 5.6 is soft for the climbing you actually encounter on-route; 5.8 would be more in-line with what you climb, especially if you choose to do the NE Face of Pingora and the S Summit of Sharks Nose. Also, the Traverse as you have described is definitely a grade V for most parties. Climb the NE Face for added value, incredible rock, and a 50 Classics tick.